Exciting stuff :D plus it has an awesomely cool cover. Hope all's well, Dan. Very, very glad I recently subscribed. Advertising works too, Fiefdom reserved in local Waterstones, great success! It's been a season dry of fiction, so looking forwards to some 'oh yeah' moments. I used this opportunity to re-lapse into 2000AD. It's been too long and seems like a great place to start. To be frank, I picked it up again mainly because Kingdom is back. It's the best piece of dark SF I've read in ages. I also loved Fiefdom. Keep them coming :) Get whet. "With tomorrow seeing the release of 2000 AD’s special 1900th edition, two of the legendary weekly anthology’s biggest creators are joining the alien editor of 2000 AD, Tharg the Mighty, for a very special ‘Ask Me Anything’ on Reddit’s comics forum. On Wednesday September 24th from 1pm GMT (8am EST) , Dan, Ian, and the green-skinned alien being known only as Tharg will be taking questions from Earthlets to mark the publication of Prog 1900, the perfect jumping on point for new readers. This is a rare opportunity to grill the editor of the Galaxy’s Greatest Comic about the line-up for this special issue and his plans for future Thrills! Abnett is known not only for creating Sinister Dexter and Kingdom for 2000 AD but also for having his reinvention of Marvel’s Guardians of the Galaxy turned into the summer’s biggest movie. Edginton is the New York Times bestselling writer behind Hinterkind and Leviathan. Tharg the Mighty is originally from Quaxxann in the Betelgeuse system. He landed in the UK in 1977 and established 2000 AD as the Galaxy’s Greatest Comic to bring Thrill-power to the people of Earth, and combat Thrill Suckers everywhere. His teams of creative robots, called Droids, put together every issue of 2000 AD from the Nerve Centre, deep in the heart of Oxfordshire. 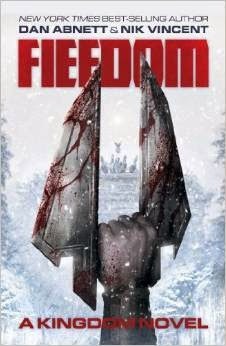 The Reddit comics forum can be found here: www.reddit.com/r/comicbooks/ "
Found, and read, "Fiefdom" while on vacation last week, without having ever ever heard of "Kingdom". I was not disappointed, except by the fact that I want to find out more about the Aux, Them, and who the Master was/is.